The activity proposed here consists of 1. 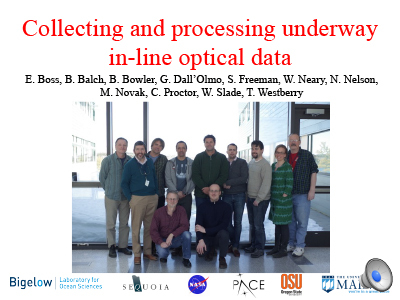 Creating a consortium of practitioners interested in standardizing collection and processing of high horizontal resolution data collected using flowthrough in-line systems, 2. Sharing associated codes, 3. Providing the community with a plan for deployment, processing and computation of estimated uncertainties associated with in-line data, and 4. 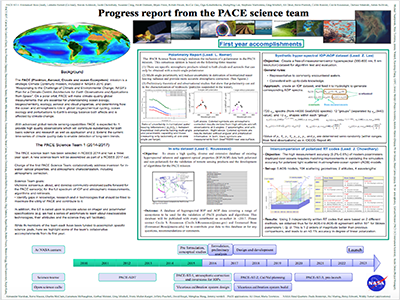 Creating a uniformly processed dataset for Cal/Val activities and studies of inherent optical properties (IOP) distributions throughout the world's oceans. Such a dataset will be unique in its global extent, being ideal for validation of remote sensing product and for algorithm development for a global mission such as PACE. Critical evaluation of the in-line IOP acquisition is necessary to assign realistic uncertainties to those IOPs. 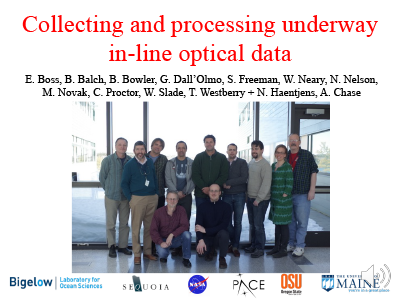 Once processing methodology is agreed upon among the collaborators, UMaine will reprocess historical in-line data collected by the collaborators and provide them to SeaBASS with the processing algorithms and source codes for future use by the ocean color community. Efforts will be made such that data generated will have sufficient details so that alternative processing could be applied without the need to reprocess the raw data. As part of this proposal we will use the data to answer the following SCIENCE question: What are the characteristics of sub-satellite-pixel variability in IOPs in the ocean? 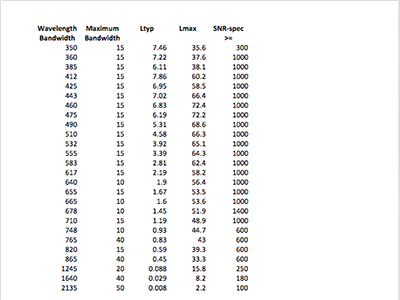 What are the deviations of IOPs from published bio-optical relationships and how do they vary with variables such as temperature, salinity, date, distance from land and ocean depth? 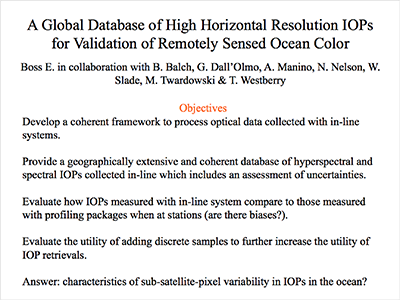 What information is available in hyperspectral IOPs (and hence hyperspectral ocean color) in addition to that currently obtained with spectral sensors (e.g. added pigments in addition to chlorophyll a (e.g. Chase et al., 2014), size information etc.)? As part of this proposal we will use the data to answer the following METHODOLOGICAL questions: 1. 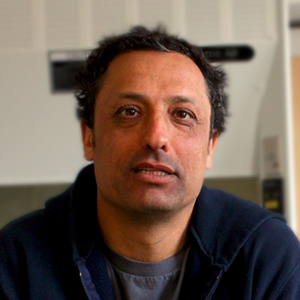 What should we acquire as discrete samples to increase the utility of the in-line systems? 2. How do in-line data compare to in-water data collected with similar sensors at the same time (e.g. are there noticeable biases in in-line data?)? Answering these methodological questions will improve in-line collection and our estimates of uncertainties for the data collected. Uncertainties are necessary to evaluate the degree of agreement between remote and in-situ estimates of IOPs as well as biogeochemical quantities. PI Boss also proposes himself to be the IOP Science team lead. *Brewin, R.J., Dall'Olmo, W.G., Pardo, S., van Dongen-Vogels, V., and Boss, E.S. (2016). Underway Spectrophotometry Along the Atlantic Meridional Transect Reveals High Performance in Satellite Chlorophyll Retrievals, Remote Sens Environ, 183, 82-97, dos: 10.1016/j.rse.2016.05.005. 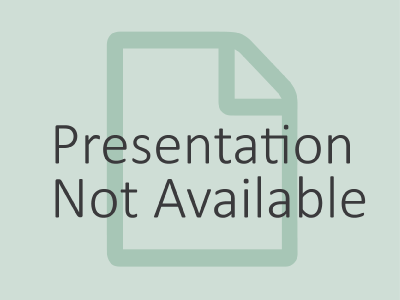 *Zhai, P.-W., Hu, Y., Winker, D.M., Franz, B.A., and Boss, E. (2015). 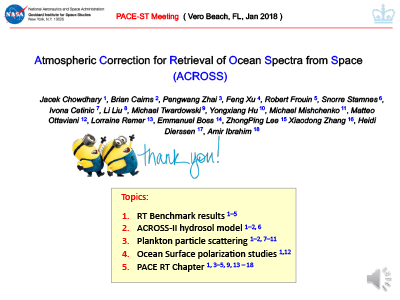 Contribution of Raman Scattering to Polarized Radiation Field in Ocean Waters, Opt. Express, 23(18), 23582-23596, doi: 10.1364/oe.23.023582. *Brewin, R.J.W., Raitsos, D.E., Dall'Olmo, G., Zarokanellos, N., Jackson, T., Racault, M-F., Boss, E.S., Sathyendranath, s., Jones, B.H., and Hoteit, I. (2015). Regional Ocean-colour Chlorophyll Algorithms for the Red Sea, Remote Sens Environ, 165, 64-85, doi: 10.1016/j.rse.2015.04.024.